‘Alternate State’ is a solo exhibition by Brian Kielt. whose works explore methods of depicting the phenomenological. Life is in a constant state of change and experiences may merge fact and fabrication throughout. The exhibition was held in the Duncairn Arts Centre, Belfast, in March '15. 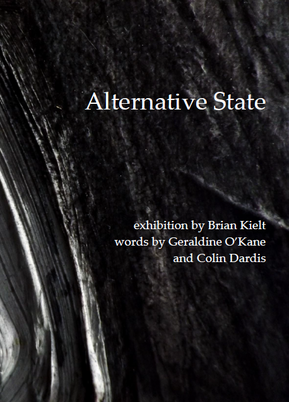 The chapbook, 'Alternative State' contains sixteen poems, all especially written by Geraldine O'Kane and Colin Dardis to provide alternative narratives for Brian's paintings. These literary interpretations can guide or misguide the viewer into other realms of interpretation. All proceeds from the chapbook go to StART Talking, a student initiative to raise awareness and education for mental health issues in the student community.